governed at least partly by considerations of fairness, but what happens in a laboratory when such fairness considerations supposedly conflict with game-theoretic predictions? Behavioral economists, who emphasize the importance of other-regarding or social preferences, sometimes argue that their findings threaten traditional game theory. 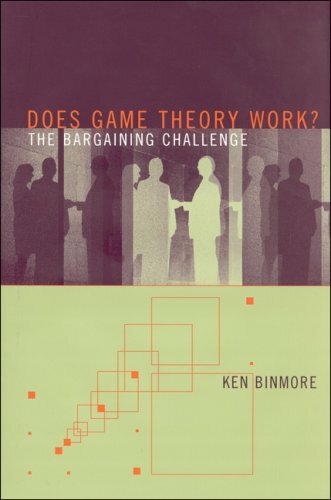 Binmore disputes both their interpretations of their findings and their claims about what game theorists think it reasonable to predict. Binmore's findings from two decades of game theory experiments have made a lasting contribution to economics. These papers--some coauthored with other leading economists, including Larry Samuelson, Avner Shaked, and John Sutton--show that game theory does indeed work in favorable laboratory environments, even in the challenging case of bargaining. "Does Minimax Work? An Experimental Study"
"Testing Noncooperative Bargaining Theory: A Preliminary Study"
"Do People Exploit Their Bargaining Power? An Experimental Study"
"Hard Bargains and Lost Opportunities"
"A Little Behavioralism Can Go a Long Way"
"Fairness or Gamesmanship in Bargaining: An Experimental Study"
"A Note on Backward Induction"
"Learning to be Imperfect: The Ultimatum Game"